Old friends were reunited and new friends made over a mutual love for dolls during the 60th annual meeting of The United Federation of Doll Clubs and the Original Doll Artist Council of America convention held in Atlanta, Ga., the week of July 12. As much as these events spoke to the traditional beauty of doll collecting and artistry, they also revealed its changing state from a once-vibrant and growing hobby decades ago, to a pastime that is rapidly aging out. Aging Collectors. Most avid doll collectors now are over the age of 50. Doll collecting encompasses largely the same group of people who began collecting in 1976, when dolls became the third largest collectible in the world. Although there are new collectors joining, every year the number dwindles. Since children’s attention is increasingly devoted to other things, they outgrow dolls at an early age. Most girls stop playing with dolls around 8 years old — maybe 10. According to Colette Shockley of the Littlest Princess Doll Shoppe in Norcross, Ga., and Glenda Jackson of Dolly Dears in Birmingham, Ala., little girls still love dolls. But it’s the grandmothers who are their best customers. Many parents feel they do not have the money or space to indulge in collectibles. Top-Tier Survival. The auctions and sales rooms at the recent events sold some of the dolls for the highest prices remembered by those in attendance, with some antique dolls going for more than $20,000. History was made at Theriault’s Auction when a French art doll with an estimated bid of $124,000 sold for $263,000 to a Boston collector, surpassing the previous bidding record for dolls: $215,000 in 2003. The rich and famous are collecting, but their attention is devoted to one of a kind (OOAK) dolls, rare antiques and artifacts. Only doll shops that carry high-end dolls are still in business, and many are just hanging on. In most cases, the collector is dealing directly with the artist or seller. Quality, Not Quantity. Since collectors are looking at OOAK and antique dolls, or very limited editions, that are signed by the artist, thousands of porcelain and medium-priced vinyl dolls remain on shelves. In a recession, it is difficult for collectors to sell dolls in order to upgrade their collections, and many have simply run out of display space. New collectors are starting at the top and buying only the best; therefore, many dolls that have been collected have not retained their value, and new dolls have even depreciated while sitting on shelves waiting to be purchased. Antiques are flourishing because many collectors have died and their children have developed their passion for collecting and the good dolls are coming back on the market. Suzanne Anderson at Old Babes in Atlanta, Ga., said she gets calls almost daily of someone wanting to sell a deceased family member’s collection. Fashion Dolls Rule. Fashion and ball-jointed dolls, such as those by Helen Kish and Robert Tonner, have a huge following. Dolls based on fashion and comic book heroes are popular now even with males, a trend that wasn’t popular when Tonner was growing up. Doll maker Linda Rick believes individuals appreciate fashion dolls because they can afford beautiful costumes for the dolls that they either can’t afford for themselves, don’t have the figure for, or don’t have an appropriate place to wear. 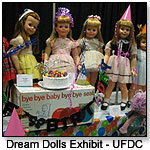 A doll tea sponsored by Doll Reader at UFDC welcomed grandmothers, mothers and little girls to tour exhibits and see how dolls have evolved over the centuries. With the median age of collectors getting older, can we expect doll collecting to be gone within a couple of generations? 1. Give children age-appropriate dolls. Giving children dolls intended for kids beyond their age only frustrates them and may cause them to lose interest in dolls early on. Refer to the list below for age awareness. 2. Let your child choose. A child should take home the doll he or she likes, not the one you like. 3. Play dolls with your kids. This not only supports necessary parent-child interaction, but also gives you a chance to tell them about your youth and the dolls you collected. 4. Get crafty. If your girl enjoys arts and crafts, reborn a doll, make a rag doll, or sew or glue fabric together to create doll clothes, then decorate them with buttons and sequins. You can even make curtains for a doll house, and gradually add new furniture and accessories, as well as members of the doll family. 5. Choose quality. Select dolls that are safe and of high quality, like those sold in specialty toy stores. With fewer dolls, a child can focus on adding to a particular line or collection with clothing and accessories. 6. Share your magazines and collections. Children will enjoy looking through doll and toy magazines with you as much as having you read them a story. You could also take some of your dolls and talk about your collection at schools or Girl Scout meetings. 7. Take children to shows and shops. The more exposure girls have to dolls, the more they will learn about and have the opportunity to appreciate them. 8. Incorporate the doll into daily life. Let the child keep a record of the doll’s adventures, whether shopping, going on vacation, or playing with friends. Encourage the child to write a story about the doll, or put on a play featuring the character. 9. Host an event. Take children and parents through your home for a holiday tour, and answer questions about your dolls. Or, invite fellow doll collectors and their children or grandchildren over for an old-fashioned tea party with the good china. 10. Form a club. Let your child and her friends form a doll club with regular meetings. Organize an occasional art activity, plan a trip to an American Girl shop or local toy store, or help them raise money to donate dolls to a children’s home for the holidays. 11. Don’t give a child’s dolls to younger siblings. Explain to a child that his doll is his doll forever, and it should be taken care of. 1-3 years Soft dolls, such as those from Alexander Doll Co., Goldberger or Kathe Kruse [from Europlay]. Make sure the doll is the right size for the child to hold, carry, and cuddle. See a variety of dolls below. Photos in the article are from the UFDC and ODACA gatherings. 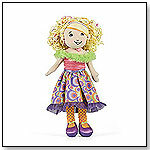 Very stylish and full of mischievous charm, Les Dollies toddler dolls, with their bright bold outfits - and hair! - are sure to delight budding fashionistas.Les Dollies have soft cloth bodies, vinyl faces and hands, fixed eyes and rooted hair. Tina is 16" tall and has a soft body. — This doll gets lots of play at Three Cheeky Monkeys in Los Angeles, as it's one of the many toys available to kids for hands-on activities at the store. Watch the video to hear what owner Wallace Harvey says about why Tina and other Corolle dolls are favorites at his store. This Asian-American doll is part of the Friends Forever Girls series of dolls and books that focus on friendship, character and community. She comes with "The First Day of Forever" book. Launch date: September 2009. The Only Hearts Club line of fashion and role-play dolls is filled with detail and realism aimed at encouraging young girls to follow their hearts and make good choices. Hannah Faith is 9” tall with a soft body, detailed vinyl face and long black hair. On the Only Hearts Club website, Hannah is described as a little shy, but talented at her hobbies of figure skating and gymnastics. — Three out of 43 retailers told TDmonthly in May 2009 that Only Hearts Club dolls are a top-selling doll line in their stores. Cabbage Patch Kids Surprise Newborns by JAKKS PACIFIC INC. The first thing anybody wants to know about a new baby is if it's a girl or a boy. These dolls, wrapped in a leaf, recreate this suspense when a little girl brings the doll home and unwraps the leaf to discover if the diaper is pink or blue. Launch date: Fall 2009. The Gisela Doll from Medieval Maidens is 18" tall with a soft body and is the first doll in the Medieval Maidens doll line. The clothing is historically accurate, featuring a blue dress with gold trim, chemise undergarment, socks with ribbon garters, brown faux leather shoes, and a flowered headpiece. The doll also comes with a doll stand. Glamorous all around, Lakinzie is ready to take on anything. Stylin' in pink, purple and green, her outfit features: purple shoes, pink polka dot orange tights, a cute shiny patterned dress accented with lime green fur and beautiful bright highlighted blonde hair. — Manhattan Toy’s products were listed as best sellers in spring 2009 by Steve Melody, owner of Melody’s Choices in Fayetteville, Ark. “Groovy Girls make up a good portion of the sales here, but the line offers much more,” he said. The company's longtime sweetheart, the Press 'n Dress Doll & Outfit Collection, is available in an embroiderable carry case for personalization. Developed from the concept of paper dolls, each interchangeable cloth outfit has secure Velcro® backing so kids can just “press to dress.” The product is tested and certified safe for all ages, and is designed to develop role playing and social skills. "Press ‘n Dress is absolutely perfect for the little girls who have not yet developed the small motor skills to dress and undress a traditional doll," May Grant, director of communications for Pockets of Learning, told TDmonthly. Press 'n Dress has received the following awards: Dr. Toy Best Vacation Toy in 2000; National Parenting Publications (NAPPA) Honors Award Winner in 2002; and a TDmonthly Top Toy award in 2008. Launch date: June 2009. Complete with a royal array of magnetic outfits, the Princess Elise Dress-Up Set offers a variety of activities and an even greater variety of ways to combine them. Girls can mix and match the colors and styles of the painted magnetic clothes that come with the princess figure, pretend to design fashions, tell stories about Princess Elise's adventures, and more. The set includes the dress-up doll figure, a wooden stand, and magnetic outfits and accessories. Kathe Kruse Nicki Baby Violet by EUROPLAY CORP.
Other products from EUROPLAY CORP.
Soft and fully washable, Nicki Baby dolls come in a variety of colors and are made of all natural materials. Colors include blue, violet, yellow, green, light blue, pale red, orange, rose, pink and red. — A summer 2008 survey about best-selling baby gifts found many retailers to be fans of European-made toys. — “We love Kathe Kruse’s unique products from Germany,” reported Michelle Smith of Piccolo Mondo Toys in Portland at the end of December 2008. Southern Belle Barbie Doll by MATTEL INC.
Part of the “Since 1959” collection to commemorate the most famous vintage fashion dolls, Southern Belle Barbie is designed with feminine sophistication in mind. Her delicate pink dress is edged in intricate lace, with special heed paid to realistic garment details. She sports a sleek bob haircut and elegant makeup, and represents a modern take on the classic Plantation Belle doll fashion. — Cathy Gabay, owner of The Toy Parade in Salina, Kan., told TDmonthly in April 2009 that Barbie is one of only two licenses she chooses to sell in her store. Soft and light, Minireves Bright is an adorable snuggly that will delight the very young. 6", machine-washable Minireves Bright also jingles softly when you shake her. Peek-a-boo! Only Hearts Li’l Kid Kristy loves bath time! Now you can use the enclosed bathtub with shower curtain and little ducky to give Kristy a pretend bath as her yellow Lab puppy, Sniff, tries to jump in the tub too! Juku Couture Dolls by JAKKS PACIFIC INC.
“The Juku Couture line gives young girls a creative outlet for self-expression through fashion based on the mismatched trend,” said Jennifer Caveza, VP of marketing for JAKKS Pacific. Each girl has her own story and personality: Audrina is preppy; Jun is a girly girl; Hayley is athletic and a naturalist; and Kana is a romantic punk girl. 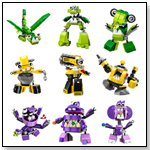 Each features multiple points of articulation and tradable clothes. Batgirl™ Barbie® Doll by MATTEL INC.
Barbie® doll as Batgirl™ looks absolutely amazing in a body-hugging black bat suit. A striking black cape with “gold” lining, yellow gloves, belt, knee-high boots, and fabulous “bat ears” complement the ensemble. Gorgeous face paint and long auburn hair give the doll an especially striking look. BATGIRL and all related characters and elements are trademarks of and © DC Comics. Production doll may vary from the photo shown above. Mattel reserves the right to modify the fashion/fabrics, sculpt, hair color/style, and accessories. Doll cannot stand alone as shown. Launch date: 2008. Doris has created an adorable new baby. She can be posed on her back looking at her hands and she can kneel. The full body offers alot of options for posing and for redressing this beautiful baby. 21" in silicone/vinyl. Tammy with her full body sculpt can be redressed in any outfit of your choice. She has pretty blonde hair and blue eyes. Doris has dressed her in a cute summery outfit with a soft green shirt and white onsie with pink ruffled edges. Accessory is not included. Limited Edition 350 pieces. •New Kid on the Block: Trio Trips Up ____? •Are Wild Creations Frogs Worth the Leap? •Product Demo Vids from ABC Kids!